The compact SUV and crossover segment is about the most competitive vehicle segment in America today. They’re everywhere on the roads, thanks to providing versatile interiors, efficient engines, and all-wheel drive capabilities that help to smooth over the most challenging road and weather conditions. Being such a competitive segment means that carmakers need to constantly be evolving and updating their entrants, to keep up with the latest trends and technology. With the 2019 Toyota RAV4, Toyota brings a fresh new face to the market. Featuring aggressive new styling, a sporty stance, and the latest in tech advances, it is a fresh new face in a segment that needs to be challenged. While the RAV4 is one of the most common SUVs you’ll see on the roads around Hazelton and Reading, the Honda CR-V is right up there as well, and the two have been going head-to-head for years. Does the 2019 Honda CR-V keep pace with the redesigned RAV4, or has Toyota really pulled ahead? Is the RAV4 or the CR-V a More Powerful SUV? It’s great to be able to choose between multiple engines – but when all of those choices are lackluster, is it really that good? The 2019 Toyota RAV4 only offers one engine, but it is a smart, efficient, powerful unit. The 2.5-liter Dynamic Force four-cylinder engine creates 203 horsepower and 184 lb-ft of torque, running through an 8-speed electronically controlled automatic transmission. Front- and all-wheel drive systems are offered, and if you opt for the Adventure grade, you get Dynamic Torque Vectoring All-Wheel Drive with Rear Driveline Disconnect, and a stouter chassis. What does this all mean? Whether you’re tackling snowy Reading winters, heading onto the dirt paths of the state parks around Hamburg, or commuting from Bethlehem into Pittsburgh, the RAV4 is equally at home. While you can choose from two engines in the 2019 Honda CR-V, neither is as impressive as what the RAV4 offers. The base 2.4-liter engine offers 184 horsepower and 180 lb-ft of torque, while the upgraded 1.5-liter turbocharged engine ups the numbers to 190 horsepower and 179 lb-ft of torque, still falling short of the RAV4. While it also offers front- and all-wheel drive choices, you can’t get the upgraded all-wheel drive that the Adventure grade of the RAV4 offers. This means the CR-V tops out at 1,500 pounds of towing capability – the RAV4 Adventure provides 3,500 pounds of towing, meaning you’ll be able to pull a good-sized family boat with the RAV4 instead of a little dinghy that will push the CR-V to its limits. Does the Toyota RAV4 or the Honda CR-V get Better Gas Mileage? Even with the upgraded capabilities, the 2019 Toyota RAV4 offers fuel economy that is as good or better than you’ll get in the 2019 Honda CR-V. The base engine in the CR-V offers 28 MPG combined with two-wheel drive and 27 MPG combined with all-wheel drive. Upgrading to the turbocharged engine achieves 30 MPG combined with two-wheel drive, and 29 MPG combined with four-wheel drive. Bigger than both of them, the 2.5-liter engine in the RAV4 is still economical. If you only want two-wheel drive, you’ll be able to get 30 MPG combined, on par with the CR-V. It gets even better if you are a commuter who does quite a bit of highway driving, as the two-wheel drive RAV4 gets 35 MPG on the open road, the best efficiency of any RAV4 or CR-V version. Even with the 3,500-pounds towing capacity, the RAV4 in all-wheel drive still gets 25 MPG around Allentown and 33 MPG highway, for 28 MPG combined. Being able to tow twice as much while only giving up a single mile per gallon in efficiency? That’s more than a fair trade. Does the RAV4 or CR-V have Better Technology Features? Today’s drivers across Hazelton and Hamburg want their vehicle to be a seamless part of their life, and to have the systems and features to stay connected at all times. This includes having power for electronics, connectivity to listen to the latest music and podcasts, and much more. 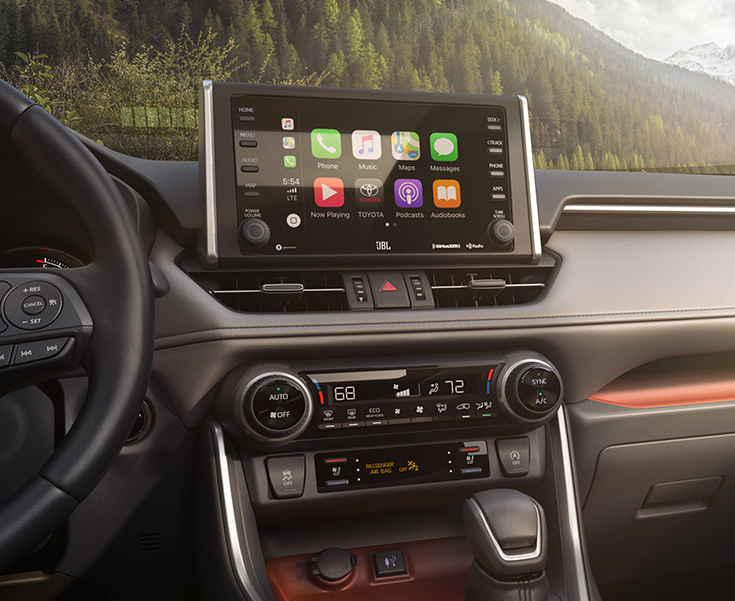 Both the 2019 Toyota RAV4 and the 2019 Honda CR-V have great connectivity, capable of connecting with your smartphone and making it easy to utilize the technology at your fingertips. The RAV4 does have some tricks up its sleeve though – for instance, if you need to keep a laptop charged while you’re on the road, the RAV4 Adventure offers a 115-volt A/C outlet. The CR-V doesn’t offer a house-current electrical outlet. While the Toyota offers the optional wireless Qi phone charging system for the front seat, allowing you and your passengers to keep personal devices charged without tangled cables, the CR-V doesn’t offer any wireless charging. Technology isn’t just about comfort – it’s also about safety. Both the RAV4 and CR-V use the latest in safety technology to make the roads and parking lots of Reading and the region safer places. This means systems including Lane Departure Alert with Steering Assist, automatic Radar Cruise Control, Road Edge Detection, and Pre-Collision systems. However, while the RAV4 makes these all standard across the full range of models, the base CR-V does not get any of these systems as standards or even available options. Toyota believes safety should be standard, no matter how spartan or luxurious you want your vehicle to be. Is the RAV4 or the CR-V a More Comfortable Vehicle? Honda loves to brag about how spacious the interior of the 2019 Honda CR-V is, and it does hold a slight edge over the 2019 Toyota RAV4 in terms of measurements. But size isn’t everything. You need an interior that strives to make everyone at home. 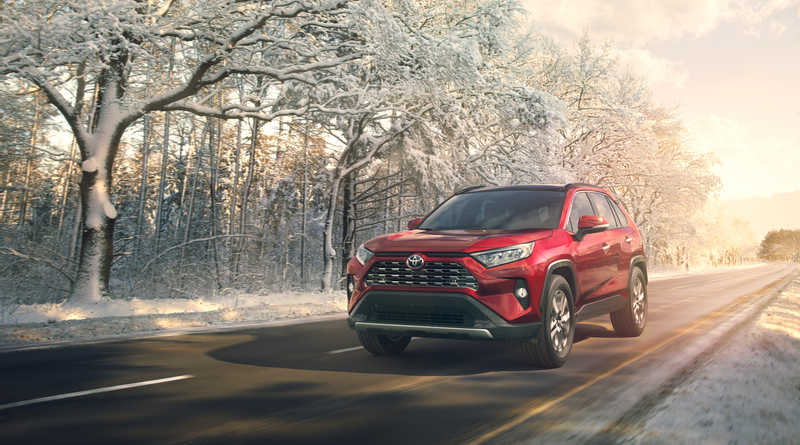 Cold Hamburg and Bethlehem winters are no match for the available heated rear seats and heated steering wheel available in the RAV4. Coupled with the optional remote start, these can help get everything warmed up in the RAV4 and ready for you and your passengers to slip in to. The CR-V doesn’t offer either of these features. It doesn’t get any better in the summertime – while the RAV4 offers ventilated front seats for cooling, the CR-V doesn’t. The 2019 Toyota RAV4 also comes backed by the great service you’ve come to expect from Freedom Toyota of Hamburg, as well as the incredible resale values and reliability scores that have been the hallmark of Toyota over the years. The 2019 Honda CR-V has clearly taken second place to the RAV4, making the RAV4 the smart buy for drivers throughout the Hamburg and Reading region. There’s no better place to check out the variety of trims available in the RAV4 than right here at Freedom Toyota of Hamburg, so stop in today and have a chat!